As a Catholic educational community, Duchesne not only educates students to high secular standards, but also educates students to live the Gospel of Jesus Christ and participate in the traditions of the Catholic Church. This spiritual education includes an education in service, which was taught and exemplified by Jesus Christ. 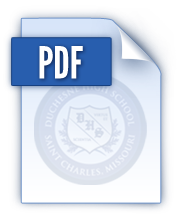 Duchesne requires that each student perform a minimum of 100 hours of service for graduation. We suggest that you work at a pace of at least 25 hours per year to reach the requirement. Most students do well beyond this number. Students will record their hours on the Service Form (available above). They must turn it in to Mrs. Kristina Radley, who confirms all submitted hours and maintains a current record total for each student. Mrs. Radley will contact you if any of your submitted hours do not qualify under the school's definition of service. Students must submit service hours within 60 days of having performed the service otherwise it will not be counted. At Duchesne, we define Christian Service as any activity done without payment that assists another human being to fulfill a basic human need. A basic human need is one of the following: life, health, food, shelter, clothing, and education (the corporal and spiritual works of mercy, CCC 2447). Please note that life, health, food, and education can be interpreted on both a physical and spiritual level. Also, caring for the earth and animals (through recycling programs, park and recreation events, or animal shelters) will count as service as it contributes to the interdependent health of all God's creation. Above is a PDF of local service organizations that fit under each of these criteria. The Service Moderator will consider proposals for service that meet a basic human need other than the ones listed, but the decision rests with the Moderator. If you are unsure whether your project will be considered service work, we encourage you to ask in advance. If you have any questions, you can contact the Campus Minister, Mrs. Kristina Radley, at kradley@duchesne-hs.org. All service hours submitted are subject to the approval of Mrs. Radley. Finally, while we do accept service hours from students' work with organizations such as Boy Scouts and Girl Scouts, Key Club, Outreach, and National Honor Society, not all activities done with those organizations will count as service according to the definition of service as fulfilling some basic human need. - Any work done for a family member or relative (grand-parent, aunt, uncle, cousin) cannot be counted as service. The reason for this is because family obligation coincides too closely with service work for us to fairly assess the service. - Babysitting, dog sitting, or house-sitting is typically not service unless it is a response to a medical emergency or an extreme situation. - Yard work or shoveling snow is not service unless the person for whom you are working cannot shovel or mow the yard himself or herself due to old age or disability. - Any activity that earns money that benefits an organization that is a for-profit business such as a club sports team, a for-profit medical center, or restaurant is not service. Anytime you assist at a fundraiser, inquire where the money is going and whether it is going to a non-profit organization or a private person who needs assistance (i.e. for medical bills).